A seemingly decent phone that needs a low price to go alongside. The LG Spirit is one of four new phones announced by LG at MWC 2015, and while it doesn't quite have the punch of the Magna, it's pretty close. The battery is a little smaller at 2100mAh, although with a 4.7-inch 720p screen to power it's going to be quite light on the power pack. It offers a pixel resolution of 720 x 1280 meaning the screen has 321ppi. The Spirit's display is a great size meaning it's easy for my hands to reach all over the display and the fact it's not Full HD wasn't instantly noticeable. It would have been nice to get a Full HD offering here but that's not exactly possible when it's a set of mid-range handsets though so LG has opted for the next best thing. The phone uses a quad core chip clocked at 1.3GHz, so should be up to all the heavy lifting needed. As for RAM the LG Spirit comes with 1GB, the norm for this kind of handset. In terms of design, the LG Spirit feels compact and soft in the hand, with the elegant curve on the back belying the lower cost of production. 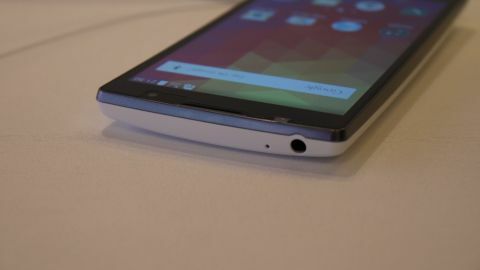 The sides are slightly angular, and the buttons once again placed on the back – knocking the screen is the best way to unlock it, but you can also hit the rear power button. LG has made a smart decision to keep the back button feature across the majority of its handsets, it feels like a unique take and the Knock On feature is always there to make life even easier. The screen itself is nice and bright, with LG's In-cell technology improving contrast ratios and responsiveness under the finger… it's certainly got a lot more sensitivity than expected for a mid-range phone. Colours looked good all over and viewing angles didn't seem to be a problem either. The latest and greatest Android 5.0 Lollipop is running on the LG Spirit with LG's own UI overlay. Seeing the newest version of Android, and the best yet, running on a mid-range handset is a joy and one of the main benefits of the Spirit. As for the camera set up, there's an 8MP rear snapper that is likely to keep most people looking for a low cost device happy. On the front is a 1MP selfie snapper – not exactly the high quality camera some would want but it'll do to send a few Snapchat's or upload your face to Instagram. There is only 8GB of internal storage, an oversight on LG's part, so you won't be able to hold much of your favourite media. LG has yet to confirm whether the Spirit will come with a microSD slot but we'd like to think it will considering how little internal storage it is providing. LG is yet to reveal whether the handset will be capable of 4G connectivity but the fact there hasn't been confirmation yet suggests there won't be. Most users looking for a mid-range handset are unlikely to need LTE connectivity but it's always nice to have that waiting if you do. The battery shouldn't be a big concern considering it's only gone down 50mAh from its predecessor, but that said it wasn't the stand out feature before so we'll be sure to put it through its paces in our full review. So far we're not sure which countries the LG Spirit will be coming to but we can speculate it'll come to the UK, US and Australia at some point in the next couple of months. The LG Spirit is a mid-range phone that needs a competitive price to avoid sinking below the surface in a congested market. All round the build quality and screen seem more than decent with a relatively impressive camera on the rear. A red flag pops up for the lack of internal storage but that'll easily be sorted if the company opts to include a microSD slot. It will also be a shame if the handset is confirmed not to have LTE connectivity but it won't make or break the phone. Only time will tell if it gets dubbed the big winner in this quartet of new phones and it looks like the deciding factor will likely be the price.